We’d love your help. Let us know what’s wrong with this preview of The Curse of Oak Island by Randall Sullivan. S In 1795, a teenager discovered a mysterious circular depression in the ground on Oak Island, in Nova Scotia, Canada, and ignited rumors of buried treasure. Early excavators uncovered a clay-lined shaft containing layers of soil interspersed with wooden platforms, but when they reached a depth of ninety feet, water poured into the shaft and made further digging impossible. To ask other readers questions about The Curse of Oak Island, please sign up. Does this book contain any photographs? I'd like to get it for a gift for my husband, who follows this show. But I know he will want to see photos, maps, diagrams, etc. Thank you! As much a book of mythology and storytelling as one of history and mystery, The Curse of Oak Island is the perfect companion piece for those of us who watch the show and wonder at the details beneath the narrative. There's a reason the show is one of the highest rated original programs on cable TV, but there's only so much they can cover in a season, and the recaps (often of previous recaps) add to the challenge. There's a reason Randall Sullivan subtitled his book The Story of the World’s Longes As much a book of mythology and storytelling as one of history and mystery, The Curse of Oak Island is the perfect companion piece for those of us who watch the show and wonder at the details beneath the narrative. There's a reason the show is one of the highest rated original programs on cable TV, but there's only so much they can cover in a season, and the recaps (often of previous recaps) add to the challenge. There's a reason Randall Sullivan subtitled his book The Story of the World’s Longest Treasure Hunt, and 223 years of treasure hunting is a massive story to be explored. While there are many ways he could have approached the subject matter, Sullivan chooses to move chronologically through the searchers, hunters, and diggers, painting a vivid picture of an island riddled with as many holes as theories. You don't really get a sense of the damage done in watching the show, but reading how each search built on the one before it, it's almost overwhelming. For every hole or tunnel talked about on the show, there are a dozen others running through the island. Speaking of damage, Sullivan doesn't withhold his criticism of the extensive damage done by Robert Dunfield, reshaping the landscape so brutally that the Province of Nova Scotia considered putting an end to the treasure hunt and turning the island into a nature preserve. He also doesn't shy away from the fact that Fred Nolan deliberately removed or destroyed key markers, consigning those details to memories lost with his passing, and a veritable treasure trove of surveying maps that may never see the light of day. That's not to say that Sullivan indulges in judgmental sensationalism, just that he's a little more forthcoming and a little less cautious than the cast and crew. Although the book is very closely tied to the show, as evidenced by the History logo on the cover, it is not merely a promotional vehicle for the next season. Sullivan reveals some interesting warts about the production, even going so far as to acknowledge that "both of the Lagina brothers were nagged by the suspicion that the maravedi [found in the swamp in the first season finale] had been planted at the Mercy Point by the producers of The Curse of Oak Island." It was a key moment in the search, turning a one-and-done season into an ongoing series, and while Sullivan defends the producers, it's interesting that he calls it out. He also talks of other moments where theories were abandoned, details pushed aside, and entire conversations left on the cutting room floor, all to pursue something more ratings-worthy. It's not just the producers who have an agenda, however, but cast members who don't like having facts get in the way of their own pet theories, as Sullivan found one when trying to dissuade Marty from the theory of Marie Antoinette’s jewels. "One more time, I reminded myself that I would accomplish more on Oak Island by listening than I would by sharing my opinions." If you watch the show, then you know it is as much about personalities as it is mysteries, and that's where The Curse of Oak Island holds some of its biggest surprises. For instance, we learn more about the Restall family, turning an already sad story into something truly tragic, and we get some insights into who the Lagina brothers are, how they made their fortune, and what brought them to the island. Even more importantly, though, we get the full story of the feud between Fred Nolan and Dan Blankenship, a story of shady deals, backstabbing, violent threats, obstruction, legal persecution, and ruined reputations. Coming away from those chapters, you finally understand the depth of their enmity for one another, and appreciate just how significant their cooperation with the Lagina brothers ultimately was. Dan Henskee gets some interesting page time as well, but I'll come back to him later. Of course, most people will be reading this for the legends, the history, and the mythology of the treasure, hoping to see their favorite theory advanced, or their least favorite debunked. While some of those chapters can become a bit dry in the reading, Sullivan goes all out in researching the facts, presenting a fair, unbiased view of what is possible versus what is plausible. He is honest about which theories he was most interested in as a writer, and which fascinated him most during his time on the island, but he gives the big ones - Pirates, the Knights Templar, Sir Francis Bacon, the Masons - equal time, pointing out what makes them plausible, but never shying away from picking at what makes them unlikely. Along the way he passes some very harsh judgment on key figures who have appeared on the show, most notably Kathleen McGowan, a "derivative author," and Joan Harris, "who married delusions of grandeur to extreme gullibility." The Curse of Oak Island is a much longer book than I expected, and a much deeper book than I could have hoped for, required reading for anybody with an interest in the hunt, the mystery, and the personalities involved. It does a lot of debunking, and calls out the Dan Brown-ing of history by theorists who build fictions on top of facts, selecting details that fit their theories and ignoring others, but Sullivan also does something vitally important - he justifies the whole treasure hunt, making a case for there being something significant buried below, while discrediting the idea that the original searchers found all that there was to find. Meticulously-written, thoroughly-researched, including first person accounts, of the search for treasure (Possibly? Supposedly?) buried under Oak Island, located off the coast of Nova Scotia, Canada. Since the late 1700's, when three young men found a decaying block-and-tackle hanging from the branch of an oak tree, with underneath it a depression which might have indicated some kind of subsidence - something buried there? - men, and a few women, have dug and tunneled and dug and tunneled some mo Meticulously-written, thoroughly-researched, including first person accounts, of the search for treasure (Possibly? Supposedly?) buried under Oak Island, located off the coast of Nova Scotia, Canada. Since the late 1700's, when three young men found a decaying block-and-tackle hanging from the branch of an oak tree, with underneath it a depression which might have indicated some kind of subsidence - something buried there? - men, and a few women, have dug and tunneled and dug and tunneled some more. Their finds so far? A few old coins. A few old buttons. Lots of pieces of wood which might have been cut and fashioned some time from the 1500's up to the late 1700's. Platforms? Maybe. Also, complex drainage systems to keep water from the various networks of pits and tunnels located under and through the island. Rocks with words, etchings, symbols on them? Maybe. Rocks lined up in triangle formation and spruce poles buried in the ground. Mr. Sullivan does a great job here, great in that he covers every possible explorer, digger, treasure hunter, island-property owner, all the way from the late 1700's up and to the year 2017. He wrote a story on the subject for Rolling Stone in 2003/2004, and later returned to Oak Island to interview the current 'explorers' and those involved with the television show for this book. In other words, this author was THOROUGH. If this book doesn't become one of the source books on the topic, I'll eat some oak leaves. He also shows true non-bias throughout, covering every possible theory, angle, conspiracy-thing, historical event, and whatever, which has a connection, however remote, odd or strange with Oak Island. Does he believe that someone - or a group of someones - buried something of significance on the island? Yes, and maybe no. He's a skeptic who admits to being awed or surprised at things which turn up. Possible 'treasure' includes pirate spoils, Inca treasure, precious documents or other artifacts. There ARE many accounts of Spanish galleons, returning to Spain, or English returning to England, etc., which never arrived, which are believed sunken, lost, shipwrecked, looted or stolen. (And sometimes one of these 'lost ships' does turn up.) It's also true that the inhabitants of the area (of Oak Island) do occasionally find old coins, or even a bag of coins, on neighboring islands. There's just enough going on up there to keep people constantly digging, forming corporations, arguing amongst themselves, and dragging out whatever state-of-the-art 'finding' equipment there is in order to keep digging. Men have lost millions of dollars in this enterprise - no kidding. Some have spent a huge chunk of their lives devoted to the cause. (A few died in the effort.) And every time one group of men ages out, dies, or loses interest, another one steps in. It's a haunting premise which will only end when something BIG is found. As I said, I won this book through Goodreads and am very glad I did. I read every word. If you like the show, this book documents the history of the search including all of the wild theories. I wish there was more time spent on the Laginas and less on the previous searchers, but it is a must read for those following the show. There is so much information in this book I don’t even know where to start! The story of Oak Island is something I have grown up with. It was taught to us in our history classes, there were books on it in the school libraries and everyone knew what you were talking about if you mentioned “that place with the booby-trapped treasure”. I’m from Nova Scotia so the Island is common knowledge and I still love learning more about it. Oak Island is the mystery that doesn’t get old. As soon as I started r There is so much information in this book I don’t even know where to start! As soon as I started reading Randall Sullivan’s book, I knew I was about to get a wealth of information. It was almost overwhelming, to be honest. The amount of time and research that has gone into writing this…amazing. I think what I love most about The Curse of Oak Island is that Sullivan really goes in depth with every possible aspect of this mystery. I mean, REALLY in depth. I don’t think I have ever read any book, on any subject, that is so meticulous and complete. He doesn’t just dive into the “curse” itself, but the entire history of the Island; the explorers, the conspiracies, the possibilities….everything is in this book. This needs to become a reference in schools that still study this part of Nova Scotian history because the textbook writers have nothing compared to Randall Sullivan. I think any Oak Island history buff will enjoy this book. No matter how much or little knowledge you think you may have on the subject I assure you that you will learn something new. Keep in mind, though, that this is NOT light reading. This book is long and it takes a bit of work to read. It’s not something for a relaxing weekend. I recommend reading in sections, even though you’re going to want to keep going. You won’t get an information overload and it does help to let it all marinate a while before diving back in. If you ever wanted to learn about one of the biggest mysteries in Nova Scotian history, this is the only book you need. I love Oak Island! If you know me, you know how much I love this show! I have not missed an episode in all the seasons it has been on the History channel. Personally, I don't think we're going to find the Ark of the Covenant or Crown Jewels or Templar Treasure buried on the island; I'm leaning more toward pirate booty as it seems more historical. However, I would not mind being proved wrong. I hope they find something, I really do. So - the book! So excited to get it. I have read a few other older I love Oak Island! If you know me, you know how much I love this show! I have not missed an episode in all the seasons it has been on the History channel. So - the book! So excited to get it. I have read a few other older books on Oak Island (once I became a diehard Acorn). I knew some of the history that Randall Sullivan discusses in his book but I didn't mind reading it again and Randall also gave a lot more detail and more history than what I had previously read so I enjoyed the beginning of this book. The ending was pretty good, too. I liked how he discussed the show and some of the excavations that I had watched. I would have liked more about the "modern era" of Oak Island but this was still okay. Randall spent a lot of time on the theories that have been proposed by various visitors to the island and the show. We spent quite a bit of time on those theories; I would have rather read more historical Oak Island stuff but it's his book and I think people are really interested and intrigued by all these theories. He seems to get personal about things in this book and that's when it gets weird. I got the impression from watching the show that the Laginas really didn't like him. Well, Marty anyway; Rick is so nice he appears to like everyone. His visit to Oak Island seemed a little weird, just reading about it was odd. He definitely did not distance himself away from the island at some point in the book and a portion of this book was - well, I said before - weird and odd with him being a little involved with the show. I was excited to receive a Kindle ARC of The Curse of Oak Island from NetGalley. I've never seen The Curse of Oak Island show on the History Channel because I abhor reality shows and I'd rather read than watch filler banter go on for 40 minutes and 1 minute of another unsuccessful attempt to recover the treasure. Mr. Sullivan's book is an in-depth, well researched historical account of Oak Island and the many, many various theories, conspiracies, personal and professional dramas surrounding it. There is a handy and useful timeline at the back of the book that details the origins of the island, when the discovery of the Money Pit was first discovered by three young men and the subsequent exploratory and treasure hunts that followed, including what was discovered at each of those digs. The author's honest skepticism is well balanced with his research into all the theories surrounding what may be buried on the island, even the most ridiculous and offers both a compelling look at its evidence, if any, and his personal opinions on why he thinks one theory may prevail over another. And those are just the ones I remember. Then, there are the tragic deaths of some of the treasure hunters. The personal relationships destroyed. Wrecked families. Tragedy and trauma. The unexplained equipment failures and missing equipment. And I can't forget the ghost stories. The sinister feeling of foreboding and darkness that permeates the island the author clearly experienced for himself when he first set foot on the land. The strange sights and images the locals and treasure hunters saw with their own eyes. Something is not right on Oak Island. But I think the hardship of discovering what lies in the Money Pit was a good indication of that from the start. After I finished reading the book, I realized the island itself became just as mysterious as the Money Pit. As the author points out, it is difficult to discount most of the theories because they all sound plausible with just the right amount of historical and anecdotal evidence to back them up, another mystery to add to the mix. No one theory sounds solid all the way through but all of them could be true! But, unlike the author, who believes the mystery of the island will be solved in the future, I am pessimistic. At the end of the book, the author recalls what one of the treasure hunters said, that the Money Pit has caused ceaseless suffering and aggravation for all those involved in its excavation and whoever created it must be a malicious and evil person. I don't disagree. I am still intrigued by one lingering question that fascinates me more than what the Pit may be concealing; who created it? Full disclosure, I was sent this book by the publisher to review. From time to time I get sent books to review. The last one I did was the Lost History of Ancient America, and wow. So when the publishers of Randall Sullivan’s new book, The Curse of Oak Island: The Story of the World’s Longest-Treasure Hunt, reached out to me I warned them. Sure, I’d love to review it, but I’m a debunker, and I know a bit about the whacky-ness that is Oak Island. I might not be the best person to review a book on Full disclosure, I was sent this book by the publisher to review. From time to time I get sent books to review. The last one I did was the Lost History of Ancient America, and wow. So when the publishers of Randall Sullivan’s new book, The Curse of Oak Island: The Story of the World’s Longest-Treasure Hunt, reached out to me I warned them. Sure, I’d love to review it, but I’m a debunker, and I know a bit about the whacky-ness that is Oak Island. I might not be the best person to review a book on the topic. The publisher assured me that I would find the book non-fringy, and asked if I would consider it. So I said yes. I did warn them after all. Now I love getting books in the mail. Really love it, like a kid at Christmas love it. So when the shiny new hardcover arrived I was giddy. I did have to wrap of a demanding semester in grad school, so I took a brief moment to look inside. I wanted to give the book my full attention and wondered if it might be a good addition to my collection of pseudoarchaeology books by non-archaeologists that looked at pseudoarchaeology topics critically. I liked what I saw in the first few pages. Sullivan describes the original article he wrote for Rolling Stone on the Oak Island mystery. He then described his unease at the article after publication. “…when we spoke briefly about this off camera, I was acutely aware that i wasn’t confident enough in what I knew about the historical records to refute some of what he was saying. That troubled me. I was honestly put at ease with the book based on the self-reflective nature of these statements. We’ve talked about on the blog and the show, that a key feature of a lot of pseudoarchaeology is that it repels self-reflection and rejects criticism. To see Sullivan doubting his own conclusions and admitting he was caught flat-footed by Nickell was refreshing. Then I had to put the book down to finish my paper. When I picked it up again, I was ready to see how Sullivan had addressed his doubts and what he’d found in the process. A few things here before we dive into the book. I am a skeptic of Oak Island. I firmly believe that there is nothing on the island beyond the mundane, and even that has been swiss-cheesed to the point of meaninglessness by the 200-ish years of people drilling random holes into it looking for treasure. I think it’s the most abhorrent abuse of what could have been a fantastic archaeological site and due to the lack of any kind of methods or standards used by anyone who ever dug there, anything that is found on that island is immediately suspect and probably contamination from the people that dug there before whoever is digging there now. Oak Island is a shining example of why archaeology isn’t done this way and should be a warning bell to archaeologists of what can happen if we don’t communicate our methods and standards more clearly to the general public. Who knows what has been lost on that island due to the destruction of treasure hunters. That out of the way, Sullivan’s book is not a giant 410 page novel on why Oak Islands is clearly the home of Celtic, Pirate, Freemason gold and the lost works of Sir. Francis Bacon. Well, not entirely, it is a detailed history of the phenomena that is the Oak Island treasure hunt. Sullivan backs up all the way up to when the three men credited to starting this whole crap ball rolling, and then write about how he went a step further to locate the three men in time. It’s impressive, and Sullivan shows his work, talking about census records, and land deeds, and even the elusive Daniel McGinnis. Sullivan talks about his search of the historical evidence of the man, and then made a strong case as to who McGinnis was and why he’s so hard to track. His conclusions are perfectly acceptable and logical. Basically, what I’m saying here is, unlike many books on pseudoarcheology topics, Sullivan is providing fresh material and doing actual labor to find new threads for the theories presented in the book. That said, Sullivan does spend time looking at a good number of the various theories that plague Oak Island. These I find interesting because Sullivan spends time talking about the possible origins of the theory and then talks about how the theory affected the show. Sullivan’s insights into the behind-the-scenes of the Curse of Oak Island show are also interesting. Sullivan talks about his interactions with various guests, the producers, and the interactions with the show’s various on-air personalities. It’s honestly very humanizing and if you’d never watched the show you would think these are very calm, level-headed, reasonable men. Sullivan is kind in his treatment of the show, and it’s clear he’s friendly with the cast. There’s nothing wrong with this per se, but it must be kept in mind that Sullivan is sorta paid by the show to do his research for the show. I wouldn’t expect him to go on a huge “Down with the History Channel!” rant. I did feel a few times that Sullivan was maybe turning a blind eye to things, or not looking as closely as he could at things. The incident with the Spanish maravedi (piece of 8) a coin dated to the 1600s but the shows on-hand experts is a good example. Sullivan describes one of the final moments of season 2 of the show. There is a stunning moment where a Spanish maravedi coin is found, saving the show and allowing the Lagina brothers to be funded for another season of digging on the Island. It’s…a little too convenient of a find. So convenient that, according to Sullivan, even the Lagina brothers were suspicious of it. Lagina brothers both thought the coin had been planted. They confronted the producers and asked Sullivan about it. Everyone told them no, they hadn’t planted it. Still. Someone could have, given the way it was discovered and the chaos around the discovery, the desperate need for it, and the timing of it. I’ve been doing this debunking thing too long to accept that this was all coincidence. Another moment in the book that sticks out is the aforementioned on-air interview with Joe Nickell. Not the interview itself, which Sullivan doesn’t go into much, or really at all. But you can clearly tell from the writing style and words he uses that Sullivan isn’t happy about how the interview went. He basically attacks Nickell and in a very fringy ‘all skeptics are mean and wrong’ kind of way. It’s a red flag for me. As much as the book doesn’t really focus too much on one theory over another as to the ‘why’ or ‘what’ of Oak Islands’s supposed treasure, it is interesting to see which theories that Sullivan appears to like most. One about how the island was a Pirate Island like Tortuga (Haiti) and so had fortifications and smuggling tunnels built into it was interesting, but Sullivan didn’t build that out enough for it to really stick. The other one he seemed to really like is extremely convoluted and hard to follow conspiracy that Shakespeare wasn’t really the author of his plays, Sir Francis Bacon was, and that Bacon then hid all the evidence for this on Oak Island of all places. Sullivan seems to waffle on his support of this but is clearly enamored by it. The rest of the theories he brings up he treats respectfully, giving them time and research when possible. He talks about the people who possibly began a few of the lingering rumors about the supposed treasure on the island and always links back to an interview or moment on the show. He connects the dots quite well and if nothing else, brings the “why do people believe this?” into the light. I found the book interesting. It cleared up a few things and pointed some things out I didn’t know about the island and the show. Did Sullivan’s book change my opinion on the destruction of Oak Island, or justify the frankly pot-hunting behavior of the show? No. But in all honesty, I don’t think it was meant to. Sullivan’s book is just what it claims to be, despite the sensational creepy/cool cover and the huge title tie-in to the show. It is the story of the world’s longest running treasure hunt, the history of it, the men who dug, the theories they use, and the myths and legends around this island. It gives an interesting view into the other side of the camera for the TV show and gives us little glimpses into the thinking of the men currently grinding their way through the island. The Curse of Oak Island: The Story of the World’s Longest-Treasure Hunt, was well written, informative, and yes, ever so biased. I really would have liked to see an index and a bibliography, but the timeline was nice. Sullivan doesn’t really shove any particular theory down the reader’s throat, but he clearly has his favorites. Sullivan doesn’t seem to be trying to change anyone’s minds about the show or the topic beyond simply informing them. He does at times state things as facts that I am more than dubious about. Findings that are questionable at best he just accpets and then presents. But often just as quickly as he’s presented an artifact as fact, he jumps to the next theory and doesn’t really come back to it. It’s an unintentional way of showing just how messed up and unconnected all the random theories about Oak Island are. Do I think the book is a little one-sided? Yes. Do I think it only reinforced the need for professional archaeologists and standardized methodology? Yes. Do I think Oak Island is permanently damaged as a site? Yes. Am I even a little convinced about any of the theories presented by the book? No, but I also don’t accept Nickell’s theory of Freemasons’ either…so there’s that. I won’t not recommend the book. It had information in it, especially about the TV show. Just read it with your thinking hat on, and if something seems fishy or glossed over, there’s probably a reason for it. I don’t endorse the book though. Sullivan did a good job on research and it’s clear he cares about the topic. But it’s still a pro-Oak Island book, it’s still pseudoarchaeology, and it still endorses the damage being done to the island in the name of obsession and treasure. I could rant for days about the problems with the whole concept of Oak Island, and Sullivan doesn’t even touch on these issues other than to lament the lives, and fortunes lost to looking for something that is clearly not there. Sullivan could have been somewhat critical of his topic and failed to be. Yes, he was less convinced by some theories than others, but in the end, Sullivan is still hyping the romantic idea of treasure on Oak Island. He’s still adding fuel to a smoldering fire. I suppose though when you’re being paid by History Channel, funded, hyped, supported and marketed by them, are you even able to be critical? Was it even an option for Sullivan? Or was the course of this book set from the beginning, much like the finale of season 2 of the show. In 1795, a young man finds a mysterious depression on Oak Island, a small island off Nova Scotia. With two of his friends, they dig down hoping to find the lost treasure of notorious pirate, Captain Kidd. Digging down 10 feet, they find a barrier of logs. They find another barrier at 20 feet. Realizing the danger of cave-in, they stop Six people have died and multiple fortunes squandered on the world’s most famous treasure hunt. The Curse of Oak Island is a comprehensive history of each attempt. It took me several weeks to read this one in many twenty-thirty minute increments. It’s one that a history buff would definitely enjoy, but at times the writing seemed more like a research paper than an amusing story of a treasure hunt. Don’t get me wrong, there’s some great stuff in the book: namely, the conflicts of the current hunt, the conspiracy theories, and the different angles groups have taken over the years to excavate the pit’s secrets. Dive into the pit for a deep look into the Oak I It took me several weeks to read this one in many twenty-thirty minute increments. It’s one that a history buff would definitely enjoy, but at times the writing seemed more like a research paper than an amusing story of a treasure hunt. Don’t get me wrong, there’s some great stuff in the book: namely, the conflicts of the current hunt, the conspiracy theories, and the different angles groups have taken over the years to excavate the pit’s secrets. Dive into the pit for a deep look into the Oak Island hunt. I was VERY excited to read this book because I'd wanted to watch the TV series based on Oak Island for a little while now. I think I'll just check out the TV series instead, because the writing in this book is really plodding and dry. I only have a casual interest in the mystery surrounding Oak Island, but this book is really more geared towards avid enthusiasts and researchers; people who want something very comprehensive and detail-heavy. This is well-researched and carefully done and I won't k I was VERY excited to read this book because I'd wanted to watch the TV series based on Oak Island for a little while now. I think I'll just check out the TV series instead, because the writing in this book is really plodding and dry. I only have a casual interest in the mystery surrounding Oak Island, but this book is really more geared towards avid enthusiasts and researchers; people who want something very comprehensive and detail-heavy. It’s a really interesti The first time I ever heard of Oak Island was during an episode of "Ancient Aliens." This had been years ago. But the idea of this island with a buried treasure no one had ever been able to reach stuck with me. I googled it a time or two after first hearing about it but didnt search too much into it. I didn’t even know it now had a reality show so I was pleasantly surprised when I found out about this book discussing the history of the island and the latest developments. It’s a really interesting story. From the “discovery” of the what would be known as the money pit in 1795, to the search still taking place on the island now over 200 years later. Sullivan details what happened since the day a teenager canoed to the island until the reality show that exist now. There’s no denying in my opinion, especially after reading this book, that the structure is manmade. But I couldn’t even begin to hypothesize about what could be at the bottom of it. What I enjoyed about this book was that Sullivan made sure that the human element was present throughout this story. It’s easy to get caught up on the mystery of Oak Island but the reality is that people lost their lives, their savings and their sanity trying to get to the bottom of this pit. As the details continued to be laid out it’s easy to see how people can become entranced but it’s also extremely dangerous. Learning about the history of these excavations was very interesting. Learning about the conspiracy theories around the treasure though, bored me. Mostly because Sullivan was very detailed in regards to the different theories and the details were plentiful, almost overwhelmingly so. It took away from the very real projects taking place on this island. With that being said they were also a driving force for the search. Overall I enjoyed this book. It’s a good mix of history and storytelling. I thought it was really well researched and Sullivan did a great job keeping me engaged. He does inject his opinion a lot which I had to get used to, especially since I was so interested in the history. It became more obvious why he was giving his opinion when I realized that he was at one point an active part of the show. I did learn a lot about the island reading this book. After reading this my curiosity is peaked and I can see myself coming back this topic or even watching the show to stay aware of what’s going on. I give this book 4 out of 5 stars. Thank you to NetGalley, Atlantic Monthly Press and Randall Sullivan for an ARC ebook copy to review. Sorry for the bit of a late review. I was out of power for 3 days due to a winter storm and am a little late on my book reviews. As always, an honest review from me. The intrigue is definitely there for a lot of people. The book made me see why so many people get caught up in searching for a treasure they’re not even sure exists. The book goes into great detail about the history of the island and Thank you to NetGalley, Atlantic Monthly Press and Randall Sullivan for an ARC ebook copy to review. Sorry for the bit of a late review. I was out of power for 3 days due to a winter storm and am a little late on my book reviews. As always, an honest review from me. The intrigue is definitely there for a lot of people. The book made me see why so many people get caught up in searching for a treasure they’re not even sure exists. The book goes into great detail about the history of the island and people throughout the ages. You will definitely learn a lot. It’s very detail oriented. I was more interested in the brief overview of the more exciting aspects, so it was a bit much for me. I absolutely loved learning about the conspiracy theories and different cultures that could possibly tie into it. A unique way to learn about atypical parts of history such as the Acadians, Templar Knights and U.S. Presidential ties to the Money Pit. Also the creepy factor was fun to read, but would freak me out in real life. Also the book is a companion to the tv show. There weren’t too many downsides to the book. It is jam packed with names, dates, and events so there’s a lot to remember. I read maybe 30-50 pages per day, because any more was too much information at once. So, not a quick read. This is the rather tragic story of a mysterious ‘pit’ that has wrecked friendships, fortunes, and lives. It tantalizes us with the offer of un-imaginable wealth or knowledge, but so far has yielded little more than scraps in exchange for lifetimes devoted to prying out its secrets. So who dug a pit, then protected it with a series of flood channels, layers of metal, clay, and logs, and then just abandoned the sight? Did they leave a treasure there? Why can’t we find it in the historical record? This is the rather tragic story of a mysterious ‘pit’ that has wrecked friendships, fortunes, and lives. It tantalizes us with the offer of un-imaginable wealth or knowledge, but so far has yielded little more than scraps in exchange for lifetimes devoted to prying out its secrets. So who dug a pit, then protected it with a series of flood channels, layers of metal, clay, and logs, and then just abandoned the sight? Did they leave a treasure there? Why can’t we find it in the historical record? What is down there? Sullivan has painstakingly combed the historical record to compile this comprehensive history of Oak Island. He details all the different excavations carried out over the last 200 plus years. I did find that eventually, the detailed description of every shaft and drill hole got really boring. That was relieved by the discussion of the history of the creation of the pit, or rather the speculation about the creation of the pit. For me, those were the best parts of the book. They were a fun mix of historical facts and speculation ranging from possibly viable to wildly impossible. About three-quarters of the way through the book, the pace picks up. He introduces us to the latest treasure hunters and theorists who have taken up the puzzle, including the story behind the History Channel’s series. The end of the book delves deeper into the various theories that have been offered to explain its existence. The merits of the Templar/Masonic and the Francis Bacon/Shakespeare theories are carefully weighed. I have to say that neither one convinced me. Actually, I found them both equally bizarre. The author doesn’t definitely state which theory he favors of the half dozen discussed, but I think I figured it out by the end of the book. He does do an excellent job of fairly presenting the conflicting theories with their varying strengths and weaknesses, and leaves it up to us to decide which one we would rather believe. Before I read this book I was only vaguely aware of The Money Pit’s existence, and I was completely ignorant of the History Channel’s series that explores it. I can’t say that it made me want to learn anymore, but I will probably check periodically to see if they have finally solved this centuries-old puzzle. There were a number of curse words. I received this as a free ARC through NetGalley and Grove Atlantic, Atlantic Monthly Press. No favorable review was required. It was my pleasure to provide my honest opinions. Book read....mystery not solved....can there be more? It’s a good read because it’s close to home and I enjoyed series on History. It does amaze me the commitment made by many personally and financially. This seems to be for fans of the t.v. show and not for people just learning about it like me. Fascinating story though. I rarely watch TV - don't have live TV in the house and my main reason is the rise of reality TV which I find vacuous and vapid. However, I had vaguely heard of Oak Island in the past (although never seen the reality TV show obviously) and was interested to read more about it when I saw this book on the shelves of Barnes and Noble. I really shouldn't read these books as the title gave away the line that was going to be taken here. This is not a criticism of Randall Sullivan as much as the topic I rarely watch TV - don't have live TV in the house and my main reason is the rise of reality TV which I find vacuous and vapid. However, I had vaguely heard of Oak Island in the past (although never seen the reality TV show obviously) and was interested to read more about it when I saw this book on the shelves of Barnes and Noble. I really shouldn't read these books as the title gave away the line that was going to be taken here. This is not a criticism of Randall Sullivan as much as the topic and, I assume, the line taken on it to keep a reality TV show spinning through several seasons. The book is initially pretty entertaining, well written in terms of being fast moving, and well researched - up to a point. And here is the key issue - nobody really knows how all this got started, and even less is known about what is supposedly under the sands of Oak Island. Therefore all speculation is game and RS does a good job at first, but the latter third of the book descends into unfalsifiable speculation, supernatural explanations and general "woo" which means all credibly vanishes, at least to this reader. In essence, this is a story of failed treasure hunting over 250+ years since the discovery of an indentation in the soil of Oak island, that revealed an interesting series of platforms and man made earth workings underground when initially excavated by a group of young men, whose identities are less than well established. Since some very tenuous discoveries initially, this has become an obsession for many, leading to the loss of fortunes, sanities and lives. RS charts the course of the "theories" as to what is under there which include: Spanish treasure from the Spanish main and the conquest of the incas, British treasure from pre-US war of independence, Sir Francis Bacon's writings from England, The treasure of the Knights Templar and on and on. These stories are unfalsifiable for the most part. I find it tiresome (and totally in keeping with realty TV) that RS should tease that he doesn't really believe these things but there are elements of interest there and one can't really dismiss them as, although there is no evidence whatsoever to support them, there is no evidence to disprove them either. Come on. That isn't how reasoned argument works. Come with a hypothesis and provide evidence to meet your burden of proof. It is virtually impossible to completely disprove anything to 100% certainty but we should be highly skeptical when there is no evidence FOR the hypothesis, as is the case for most of these "theories". He, like us all, soon became hooked by what many consider the greatest unsolved mystery in the world. This book covers everything “Oak Island,” the reasons, the hidden quest, the foes, the treasures, everything. However, before you get too excited, the one thing it does NOT cover is the answer to the key question “What did they find now?” For that, one must watch and wait. This history details the explorations of Fred Nolan, Dan Blankenship, Rick and Marty Lagina, and the multitudes that went before them. All share the same story of being captivated by Oak Island; even held hostage by it. The book spins comprehensive tales of the personal fortunes, wrecked equipment, piles of rubble, and countless hours that have been spent thus far on the quest. Included are the details of quarrels, fights, lawsuits, counter-suits, petty arguments, and endless playing of “Quien is mas macho,” all over the secrets of this little island. As viewers of “The Curse of Oak Island” television show know, this island captures people, swallows them up, explorers and viewers alike. I was given a copy of “The Curse of Oak Island” by Randall Sullivan, Atlantic Monthly Press New York, and NetGalley. I had to read this book because the island has captured me as well. If you have made it to this far in my review, you, too, are one of the treasure hunters, and you find “The Curse of Oak Island” a book you cannot put down. Ah, the old buried treasure mystery. I had no idea about OAK ISLAND and its story dating back to the 1700s until the boy became glued to the TV reality show. Now, I did not watch this show but was intrigued by the history of the "Money Pit" and since it was in Canada I thought I would delve into it. The incredible story of Oak Island, off Nova Scotia, involves hundreds of years of people spending their life savings and years of their life seeking the possibility that treasure was buried on the island, either by pirates, the Knight's Templar or some other group. The story begins with a few young men finding a depression in dirt on the island in 1795 and finding levels, like steps, and a few artifacts as they began to dig. What began 200 plus years ago with a 60 foot dig is now a massive project, complete with History Channel's The Curse of Oak Island reality show that debuted in 2014. Now there are several shafts on the island, the famous 10X that is some 200 feet, markers where six people died in their own quest and tours offered. You don't have to be a person who is obsessed with mysteries such as the Loch Ness monster, aliens and such to find this an interesting story simply because of how this belief of buried treasure took over the lives of so many. This book is the newest out there, written by Randall Sullivan who has done loads of research on Oak Island and joined Marty and Rick Lagina on their TV show. It is a fascinating read, albeit a bit involved in some spots with mind boggling historical notes, and, well, things have been found including the water 'booby traps' that flood the main Money Pit with water if you get too deep. Ever since my childhood, I've been fascinated by Oak Island. Over the years, I've read many a story, read the theories, etc. When the TV series The Curse of Oak Island debuted a few years ago, I was thrilled to be able to continue to dive deeper into the mystery. No matter how much I'd read or seen over the years, Randall Sullivan was able to unearth new tidbits of information and views of things. The book is a great overview of the 200+ years of searching for the "treasure". Starting with the e Ever since my childhood, I've been fascinated by Oak Island. Over the years, I've read many a story, read the theories, etc. When the TV series The Curse of Oak Island debuted a few years ago, I was thrilled to be able to continue to dive deeper into the mystery. No matter how much I'd read or seen over the years, Randall Sullivan was able to unearth new tidbits of information and views of things. The book is a great overview of the 200+ years of searching for the "treasure". Starting with the earliest efforts, and continuing phase by phase up to the current searchings by the Laginas, Sullivan thoroughly explores not only the history of the various attempts of solving this riddle, but also at the various theories that have been expounded. My husband and I have been following the History Channel’s The Curse of Oak Island story on television for a few years now and have enjoyed it immensely. This book takes the show a step further with a very detailed and well-researched journey into the darkest depths of the unfortunate history behind the “money pit” and multitudes secrets surrounding Oak Island. I love all the intrigue and mysteries of who actually went to Oak Island and why, how old some of the finds actually are and what these items imply. I love who was caught up with the searching for treasure and truth, such as Franklin Delano Roosevelt and what parts of the search he contributed to and his finds that added another rung in the ladder to solving the bigger mystery of Oak Island. Sullivan explores theories and debunks several with his own research. He approaches the mystery of the island like a reporter investigating a supposed crime. It’s all fascinating and I loved, loved, loved it! Just like the actual treasure on Oak Island this book's treasure was elusive. I really thought I was going to like this book and it turned out to be just okay. I found this book a tad boring. I really wanted a book that summed up what is going on and the many theories. What I got was a history of dig after dig after dig. I felt like there wasn't enough interesting material to create a compelling narrative so the author added and bogged down the book with accounts of ever two inch hole dug on the Just like the actual treasure on Oak Island this book's treasure was elusive. I really thought I was going to like this book and it turned out to be just okay. I found this book a tad boring. I really wanted a book that summed up what is going on and the many theories. What I got was a history of dig after dig after dig. I felt like there wasn't enough interesting material to create a compelling narrative so the author added and bogged down the book with accounts of ever two inch hole dug on the island. While there were interesting parts it really would have made a better article or a series of articles. I am more interested in the theories and finds and the justifications for the constant digging. I would have loved an inventory of all the artifacts found and how the correlate to each of the many theories that abound as to who dug and why. If that's what you are looking for, look elsewhere. Absolutely loved it! Having all the history of the search in a readable format is so wonderful. As a faithful fan of the series I thought I knew a lot but I knew nowhere near as much as I though (whuch is true in all life lol). There were moments I though Ohh, that is what they were talking about! For example this year finding the large hinge and somebody mentioned a gate, I had no idea about the theory of closing the floodgates and that is just one example. I personally loved hearing more about D Absolutely loved it! Having all the history of the search in a readable format is so wonderful. As a faithful fan of the series I thought I knew a lot but I knew nowhere near as much as I though (whuch is true in all life lol). I personally loved hearing more about Dan Blankenship and Mr. Nolan. I love when they were shown in the series and miss them both though I never met them personally. They do not make people like they used to sigh. I feel sorry for the generations that come after mine (I am 52) who will not have gotten to meet people of the "greatest generation." As a regular viewer of the show on which this book is based, I was curious about many of the references to the previous history of Oak Island treasure hunters, and Sullivan collects them all in this single volume. It is a history of obsession, and as he pointed out in his 2003 Rolling Stone article, on which this book builds, Sullivan notes that the real "curse" of Oak Island are all of the broken lives, families, friendships, and business partnerships associated with "the world's longest treasu As a regular viewer of the show on which this book is based, I was curious about many of the references to the previous history of Oak Island treasure hunters, and Sullivan collects them all in this single volume. It is a history of obsession, and as he pointed out in his 2003 Rolling Stone article, on which this book builds, Sullivan notes that the real "curse" of Oak Island are all of the broken lives, families, friendships, and business partnerships associated with "the world's longest treasure hunt." Sullivan weaves his own writing, visits to the island, and his speculations into the narrative he presents, and it turns into a solid, well-paced tale that reads well. I am a huge fan of the show The Curse of Oak Island, and this book was a great companion to it. It very factually presents all the theories, the people involved, and the history of the island; it manages to put everything into context very concisely. What I found most interesting were the people, the key players so to speak, and their relationships with other people involved. The bits about Fred Nol I received an ARC of this book from the publisher via Netgalley in exchange for an honest review. I am a huge fan of the show The Curse of Oak Island, and this book was a great companion to it. It very factually presents all the theories, the people involved, and the history of the island; it manages to put everything into context very concisely. What I found most interesting were the people, the key players so to speak, and their relationships with other people involved. The bits about Fred Nolan and Dan Blankenship were eye opening for me because I think television only shows one side to things. I was also surprised about the suspicions surrounding the producers possibly planting items so that the investigation would go on. The only thing I like more than a good mystery, is a treasure hunt - and this is the story of both, combined around a mysterious island with strange, archaeological structures and an abundance of symbols all pointing to some hidden thing. But what is it? Told with a passion and engagement, this book charts over 200 years of searches, finds and theories about what is hidden there - from the original works of Shakespeare, to pirate treasure, and lost crown jewels, to privateer supplies. The book als The only thing I like more than a good mystery, is a treasure hunt - and this is the story of both, combined around a mysterious island with strange, archaeological structures and an abundance of symbols all pointing to some hidden thing. But what is it? The book also graphically details the characters involved in the numerous searches, the vast amounts of money spent in pursuit of an answer, and the unearthly island happenings which further intrigue to this exciting quest. The Curse of Oak Island is a definitive read for fans of the History Channel television show. Sullivan delves deeper into the history, personalities, and theories presented only briefly on the show. His approach is mostly unbiased, though he does tell the reader his thoughts on some of the theories and the theorists that he thoroughly researches and debunks. The book is incredibly well researched and the presentation, though occasionally dry, is very readable. If you've watched The Curse of Oak The Curse of Oak Island is a definitive read for fans of the History Channel television show. Sullivan delves deeper into the history, personalities, and theories presented only briefly on the show. His approach is mostly unbiased, though he does tell the reader his thoughts on some of the theories and the theorists that he thoroughly researches and debunks. The book is incredibly well researched and the presentation, though occasionally dry, is very readable. If you've watched The Curse of Oak Island and were frustrated that snippets and possibilities were left tantalizingly unexplored, this is the book for you. 4.25 Hearts Have you watched the series? What? You haven’t? You are missing something. So here is the deal. The series on tv has been hard at work looking for treasure. Have they found any? I guess you need to watch or read to find out…. The book followed really well what has happened on the series and I will be honest and say that I have not read the last few chapters as I haven’t seen the show and didn’t want to ruin the show but I have caught up the read to the show so I will read in conjunction with the tv show which works out perfectly! 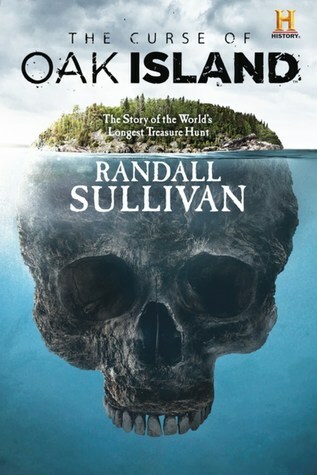 The Curse of Oak Island by Randall Sullivan is a free NetGalley ebook that I read in late November. A hidden pirate’s treasure luring in seekers from in and outside of Nova Scotia for hundreds of years. Sullivan cross-examines myth, lore, historic records, interviews, and biological/archaeological findings from modern-day excavation projects, but it's all mishmashed together somewhat frustratingly in a chronological way as the author finds it, to the point that, as a reader, I felt like I was fum The Curse of Oak Island by Randall Sullivan is a free NetGalley ebook that I read in late November.